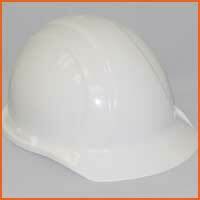 PRODUCT: LIBERTY WHITE HARD HAT, CAP STYLE SAFETY HELMET, 4-POINT SUSPENSION. 12/CASE. PRICE/CASE. Features a short peak and trim profile. 4-Point impact absorbing nylon suspension. Molded from lightweight high density polyethylene. Made in America and meets ANSI Z89.1-2003, Type 1, Class C, E & G requirements. Sold in cartons of 12. Replacement inside band materials and ratchet systems available.